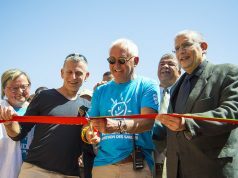 Nearly 1,000 competitors from more than 50 countries will be standing at the starting line of the 34th annual 250-kilometer ultra-marathon. 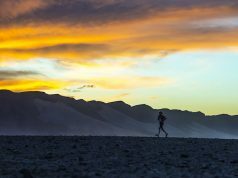 Jay Batchen, a 13 time finisher of the Marathon des Sables, reminds runners of the importance of keeping backpacks light on Thursday, April 4. Photo by Anton L. Delgado/Morocco World News. 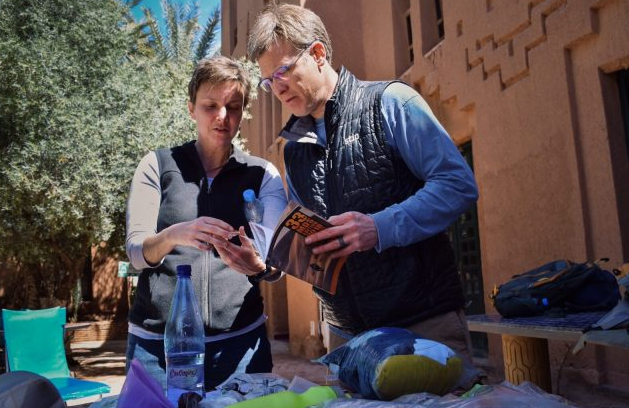 Ouarzazate – All eyes were on Jay Batchen as he began unpacking his bag to show a cluster of runners what he would be using to survive the Sahara Desert for a week while running the Marathon des Sables (MDS) in Morocco. The 49-year-old’s bruised rib throbbed as he tugged out a venom extractor, knife, signal mirror, compass, and an assortment of other tools. Each item Batchen pulled from his bag came with a story from one of the 14 times he had run the MDS. “You can never pack too much toilet paper. It’s a lot less embarrassing to throw it out than ask other runners on the side of the trail for some of theirs,” Batchen said, speaking from experience, as he showed-off a four-pack of toilet paper. 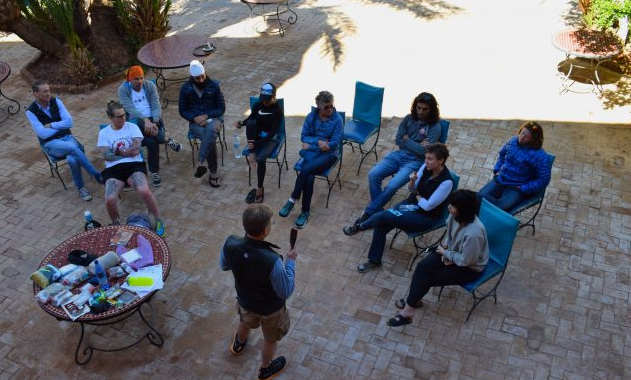 As the US representative of the MDS, Batchen’s job is to make sure each of the 32 runners, who were in the US just days ago, were ready to tackle the world’s longest desert race. Before the start of the Marathon des Sables, Jay Batchen gives US participants a pre-race bag-check on Thursday, April 4. The group will be spending a week running, eating and sleeping together in the Sahara Desert. Photo by Anton L. Delgado/Morocco World News. But the veteran runner knew that tools and gadgets could only get you so far—what mattered the most was attitude. The first time Batchen finished the MDS was in 2000. Since then he has earned 13 finisher medals. But that’s not why the race has changed his life. 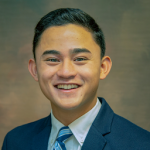 In 1999, Batchen attended the MDS as a documentarian for Discovery Channel. He was following the story of Lisa Smith, a female participant of MDS, who that year became the first American to win the women’s race. Several years later she became Lisa Smith-Batchen. 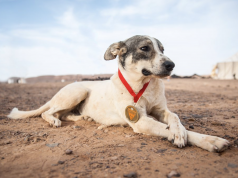 The MDS was founded in 1984, after Patrick Bauer spent 12 days alone crossing 350 kilometers of the Sahara Desert on foot. Bauer wanted to share his experience with any willing to join him. 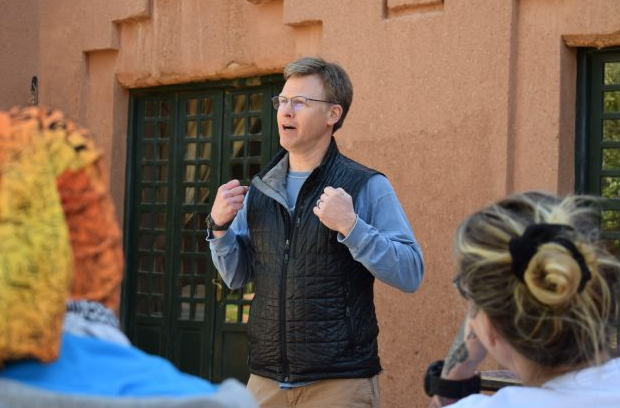 “The MDS is a powerful inner journey, a true introspection and a life path where you will find answers to questions you had never even thought of asking yourself before the start,” Bauer said in a press release. The MDS’s inaugural race in 1986 had just 23 runners. More than 30 years later, the race has had more than 20,000 participants. 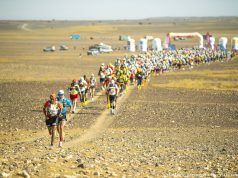 This year during the 34th MDS, there will be nearly a 1,000 people representing 51 countries running the marathon. Many, like Batchen, keep coming back for more. Which is why Bauer spends months charting a new race course each year. No two MDS routes are ever the same. In keeping with tradition, the course is kept a closely guarded secret until the day before the starting pistol goes off. The 250-kilometer race is broken down into six timed stages, each stage ranging from 30 to 90 kilometers. At the end of each stage, runners spend the night in tents together. “Tent time” each night is Batchen’s favorite part of the MDS. 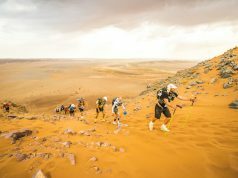 Another unique aspect of the race is its last leg, known as the “solidarity stage.” This section is timed, but does not count in the overall ranking of the race, allowing the fastest and slowest runners to tackle the end of the MDS together. Batchen believes the way the race is structured allows elite marathoners and weekend runners to share the same experience of pushing themselves to their limits. Each person running the race inspires their loved ones at home, and, according to Batchen, this is a huge source of motivation during the hardest days of the marathon. Placing the venom extractor neatly into its pouch and burying it back in his bag, Batchen wrapped up his pre-race bag-check. Early the next morning, the group would be taking a six-hour bus ride to the still-unknown location of the race’s start. As he continued packing up, all the runners split off to buy some last-minute items and double check their equipment. All but one. Despite being an experienced ultra-marathoner, Juliet Brundige wanted to perfect how to use a compass before entering the desert and starting her first MDS—she asked Batchen to help her practice. Her first attempt failed. Her second followed suit. As Batchen took the compass to demonstrate again, he reminded Brundige of how tricky compasses could be. Especially when running in the dunes of the desert. He gave Brundige back the compass. “Now, try it again,” he said.